I have been spending a lot of my Wednesdays at Union Jack Tavern which has allowed me to have a taste of the different food offerings that they have. Union Jack used to be a place that I would just pass by but never go into whenever I was at Festival Mall because I thought it was a bar filled with smoke and drunk people. Boy was I wrong. I was pleasantly surprised to find out that it was actually a resto-bar and that though there is a bit of smoke and people who drink, there were no unruly drunks and the place had a homey feel to it. I love the leather seats and the big sturdy table. I love that it reminds me of old saloons and that it looked exactly how I would imagine a British pub would be like. The first thing I was able to try here was the SEAFOOD CHOWDER and for the next 3 visits I had, it was the only thing I ordered. It was filled with lots of dory, shrimp, and salmon bits. It was SOOOO GOOD. Be careful though coz it is served piping hot. This is one of the meals that they have that is worth every peso. It's a complete meal in just one plate. 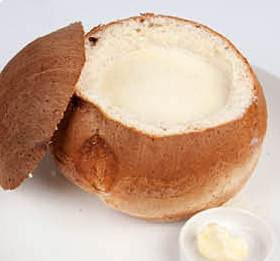 After eating the chowder, you can enjoy the bread with the butter with your coffee. I've also tried the Fisherman's Pie which costs Php425. This contains salmon, white fish and prawns with thyme infused creamy sauce and topped with fresh mash potato and grated parmesan. This was heaven in every single bite. My co-worker had the Slow Cooked Lamb Shank costs Php595 is something that I would appreciate in small doses but not in big ones. I liked the little pieces but felt overwhelmed when I had to finish an entire piece all by myself. The good thing about Union Jack is that they also have a store beside it where they sell British products. They have so many interesting things that sometimes, I just wanna gather everything and buy it all. Union Jack Tavern is located at the 2nd Floor of Festival Mall, Alabang.